attentive at Mass, and if they add another hour on Sunday, how can they expect them to behave? 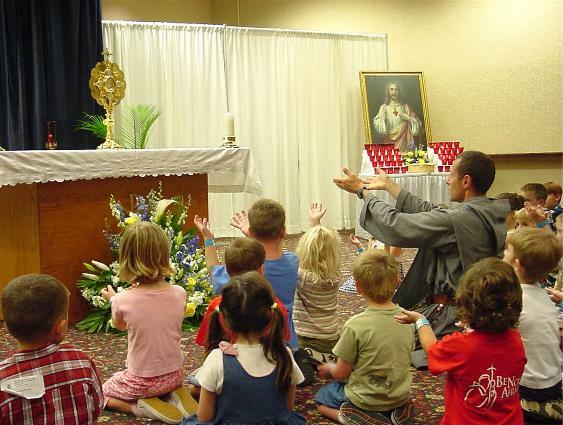 bring children to the Eucharistic Heart of Jesus! actually the person of Jesus, mysteriously hidden. on the Cross out of love for mankind. become wonderful signs of hope for those who despair in finding God on earth? -Ask your pastor if he would agree to watch the video on children's adoration. prepared or design your own format. good reason to develop a “Spirit of Adoration” in your children. presence of the loving gaze of the Father at all times in your children? make these short acts of adoration, drawing your hearts and mind briefly into the presence of God. Offer to Him the adoration He deserves. prayer. You will see how much fruit will come from this over time.